triggers a feeding response due to the prospect of wildfire destroying the hive. Bees gorge on honey to build up energy in anticipation of having to rebuild the colony. Conveniently when the internal honey storage organ is full, bees lack the dexterity to sting. Think of the tool like a giant cigar. It needs to slowly and coolly smolder rather than burn quickly with a flame. The bellow feeds air into the combusting fuel and propels the smoke out of the nozzled end. Therefore I put very combustible material in the bottom of the smoker so the heat smolders upward. The remaining space is tightly packed with a similar combustible material. This should be packed tightly enough to limit oxygen giving a slow, cool burn. Ideally the smoke should be white as blue smoke indicates a hotter fire that could injure the bees. The fuel is not crucial as anything that can be compressed enough to limit oxygen works perfectly. 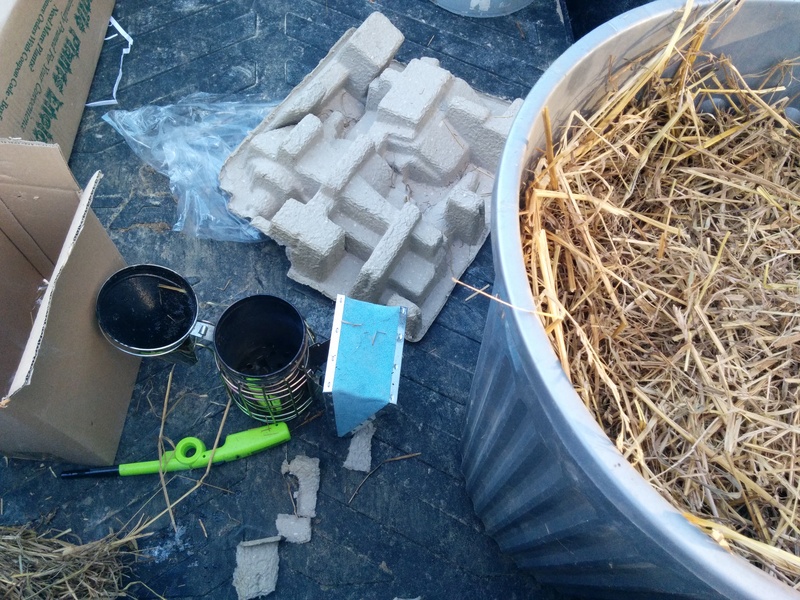 It can be dry grass clippings, dry wood shavings, dry leaves, straw, hay, corrugated cardboard, “egg carton” cardboard, etc. 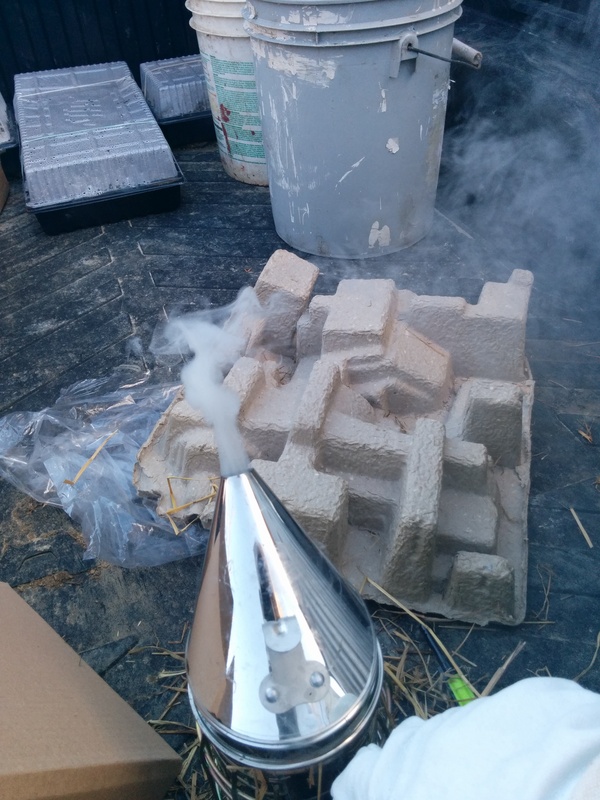 I’ve found cardboard to be difficult to limit oxygen so my smoker fuel of choice is straw or hay. 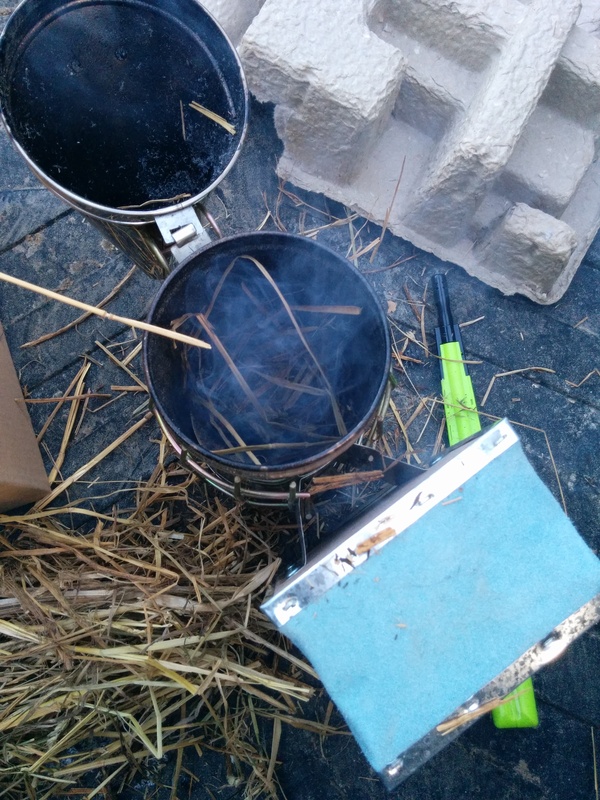 I roll it tight, drop in lit cardboard to light the smoker, then pack the straw bundle into the smoker. Generally, I will keep a small stash of dry fuel at all times limiting my need to procure fuel at the time of need. Many guides recommend using the billow to get a large flame started before packing in additional fuel. I have found this unnecessary and only a strong smoulder is required. 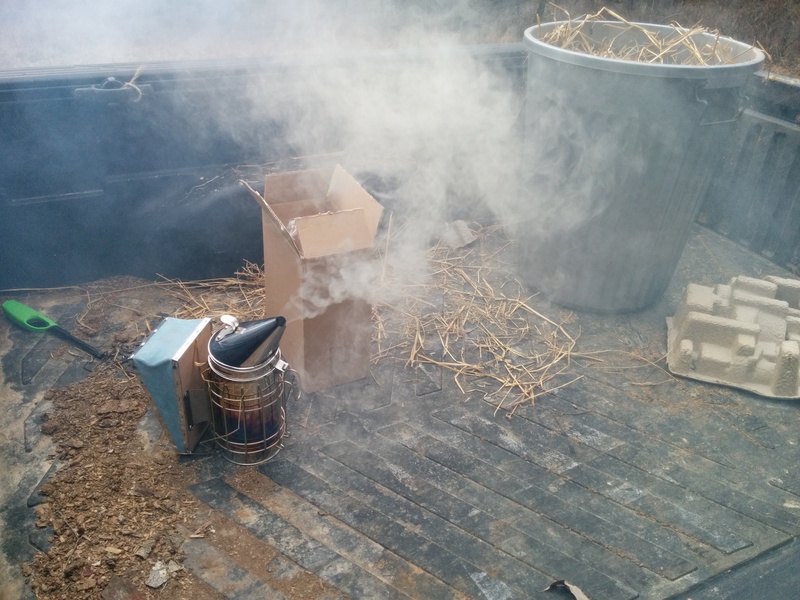 Lit cardboard dropped into smoker, lightly packed hay to encourage flame fed by a few sharp puffs of the bellow. At the bottom-left of the frame is a bundle of hay ready to be added. Lit, but hot smoker evidenced by the bluish smoke. Self sustaining smoker lit emitting cool white smoke. After doing this process once, I realized the intimidation that most guides had instilled was misplaced. It was easy to perform and fuel is readily available just about anywhere in the world where bees are kept. Heed my recommendation to dry and stash away lots of fuel before you need it and lighting the smoker will be a simple process! After all, who doesn’t enjoy wielding a little flame (well, smoke) thrower?